Labor Day weekend marks the traditional start of the general election, heralding in a series of debates, TV ad buys and campaign stops across key battleground states. Of course, most of the candidates this cycle have been running for years, with our election season getting longer and longer. To help you prepare for the endless coverage of Clinton and Trump, plus all the local races in-between, here’s some production music tracks we recommend, along with playlists to audition, as you hunt for new music to help tell the story. Holding the honest accountable, looking for answers to find the true story… this track from VideoHelper brings seriousness to a wild election. For 34 more tracks of marching beats, VH’s “Superiority Complex” album contains a complete soundtrack to this year’s election. Also be sure to check out VH’s election playlist for many more tracks. Featured on “The Good, The Bad & The Ugly” in The Vault by Stephen Arnold Music, this track headlined Fox Business’ presidential debates and has a moving, traditional march. SAM also introduced a complete political image and music toolkit for this election, dubbed “Decision 2016,” which is available on a market exclusive basis. Mixing patriotism with determination, this song on Killer Track’s “Motum Perpetuum” album layers piano with strings to create a driving beat. KT also has a full election playlist with many options. For a change of pace, “Jim Brickman – Freedom Rings: Solo Piano” features many unique American classics richly performed on piano. A rousing theme for election coverage, this track from Warner/Chappell Production Music’s “Politics Elections Patriotic” is designed to anchor the broadcast, creating a unique opening. Click here to view a full playlist of election and politics music from WCPM and to audition the track. Noble and confident, this track from FirstCom’s “The Vote” album packs subtle patriotism and is great for election returns and promos. Looking to do an election image campaign? FirstCom’s “America Strong” could fit the bill with its unique lyrics. While the general election will be over in a few short months, politics is always part of our countries spirit. 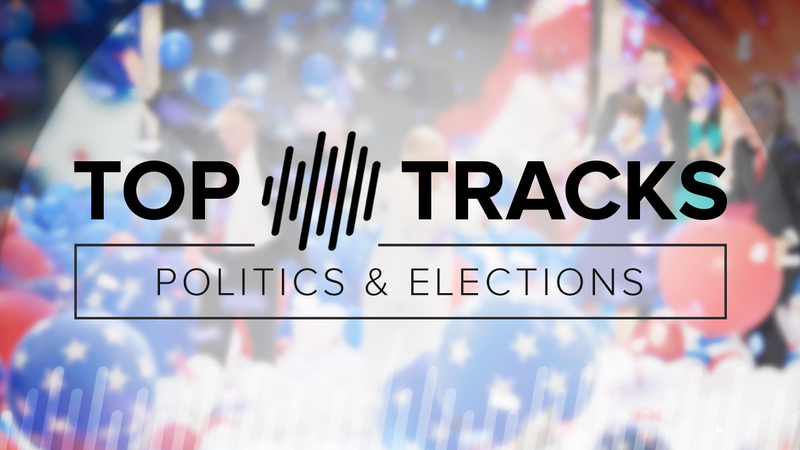 The tracks we’ve recommended for the election would also be perfect for any politics-themed show, commercial, promo or segment. What’s your favorite piece of production music for political coverage? Share with us below or on social media.